Yup. The final frontier of live broadcasting is going inside the audio of the game. 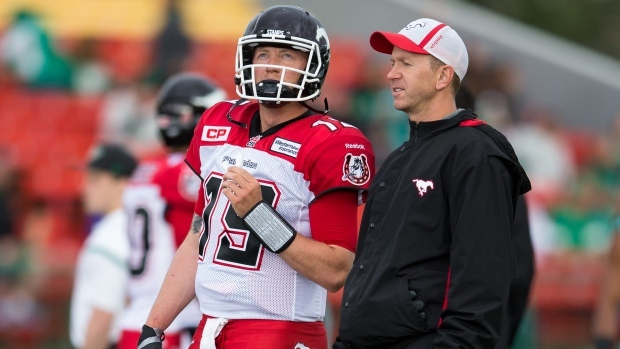 Since TSN and the league give it the go-ahead we’ve had a miked Calgary head coach Dave Dickenson taunting Roughriders’ kicker Brett Lauther before a field-goal try, saying “You’re going to miss!” (Lauther made it.) We’ve also had more than a couple of inadvertent F-bombs. And there has been the steady stream of play calls going into the helmet of the quarterbacks, then relayed to the players in the huddle. Only the cognoscenti can unscramble the jargon of "FB West Right Slot 372 Y Stick", but that’s okay, too. The secretive shroud has been lifted. For as long as the lens of the camera followed sports, broadcasters have denied fans the language, the noise, the strategy of the game. We saw lip flap. We tried to read lips. We guessed at what they were saying. But the smack talk, the beaking, the bench conferences were all conducted in a haze. When the networks were really pressed they canned some audio, censored the “s**t” out of it and put it out a few days later in a safe format. Games begin with an audience warning that some of the things you might hear could offend you. But other than that— and a very alert technician with a bleep button— CFL games are as close to a full experience that we have ever seen on conventional TV. Then there’s the natural aversion among coaches to revealing anything that might hint at injury problems or strategic decisions. To say nothing of providing grist to the coaches’ critics who can seize upon a demented decision or a personnel flareup on the sidelines to make their lives more miserable. But the success of the HBO Hard Knocks series show there’s an appetite among fans to get the nitty gritty of what happens inside dressing rooms or on the sidelines or in the general manager’s office. Watching a GM have to cut a prospect or see a player dealing with crippling injuries is both heartbreaking and endearing about players who otherwise might be seen through the prism of anthem protest or an anodyne sideline chat. For all the shade cast on the CFL, you have to give credit to the league and its exclusive broadcaster for having the nerve to defy the industry’s reluctance to go full-audio. In doing so they have stayed ahead of their cousins in the NFL on such technological and viewing innovations. The use of video replay to reverse (or call) penalties is the sort of insight that fans want— even if it makes coaches, GMs and owners blanch. Perhaps the best way to get the NFL, NHL, MSL and NBA to follow the CFL’s lead is to introduce a profit motive. As I’ve suggested for many years now, fans would probably be amenable to paying for a special channel with unlimited audio. Pay a special fee on top of your NHL CentreIce or NFL Red Zone subscription and get full live audio from games. It’s just crazy enough to work. But that’s the CFL. Sometimes it's crazy like a fox. Will Blue Jays Fans Ever Forgive Their Team For Coming So Close?